ensure that training is provided to Canadian Forces personnel in wildfire firefighting techniques. Earlier this year, the federal government announced significant changes to its Disaster Financial Assistance Arrangements. These changes, which have already come into effect, will offload additional emergency support and recovery costs onto individuals and families, provinces, territories when they are most in need of support. 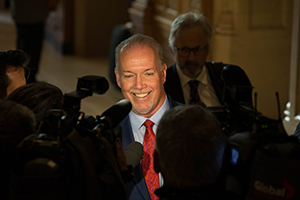 Premiers urged the federal government to reconsider its decision on the program thresholds. 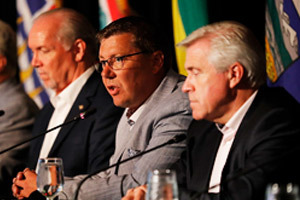 Premiers also stressed that funding in response to emergencies must be provided in a timely manner. 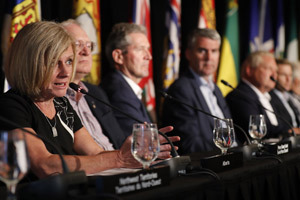 Premiers also discussed the recently announced details regarding the National Disaster Mitigation Program. 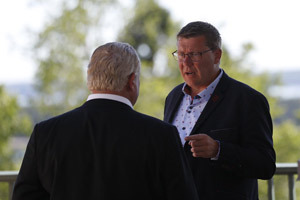 They agreed that $40 million a year for five years for the whole country is not adequate to help meet major flood protection project needs across Canada. 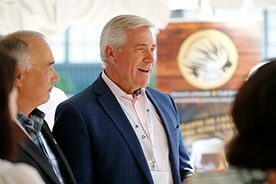 Premiers stressed that the funding for this national mitigation program must be expanded. Coverage of the program should include other events, such as wildfires, ice storms and landslides.